Got a new project which can use a great WordPress theme? Don’t have the funds to pay for a premium theme? Then we have some great news for you! 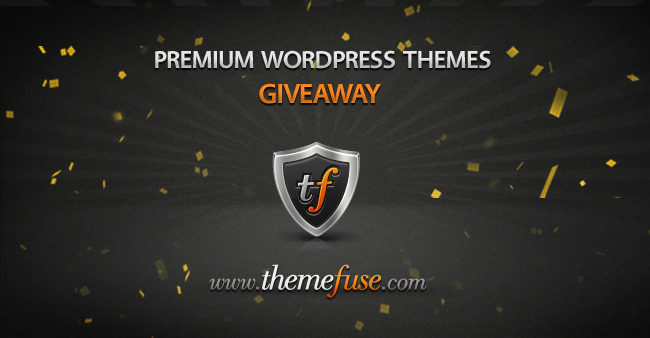 The ever so generous people at ThemeFuse have decided to give away three of their amazing premium WordPress themes for free! If you already have a blog or website of your own, chances are you have chosen to go with WordPress. But maybe your old one is getting boring or you want a premium theme and can’t afford it. Well, this is your lucky break! If you win this week’s giveaway, you will get to search through all of the great ThemeFuse themes and then download whichever one you want, for FREE. What’s so great about ThemeFuse? ThemeFuse has some of the best themes you are going to find online. With just about anything you could want, their WordPress layouts are impeccable and will fit any style or design. The user-friendly programming makes it so easy for anyone to get started and to love their results! On top of all that, ThemeFuse developed an awesome new feature that allows you to create your page in a matter of minutes. You just pick the theme you want, the hosting package suitable for you and watch the magic happen! Find out more about the hosting service. Here are some examples of the WordPress templates that ThemeFuse has to offer. For a laid back and creative look, this is the theme you would most likely want to go with. If you have a corporate website or something more upscale, this theme will definitely hit the spot with its classy look and sophisticated feel. Like to vlog? Well this video theme is just right for the avid video blogger. Get your creative juices flowing with this stylish yet unique portfolio theme! For the photographer and the on-the-go blogger, this theme is what you need most. Compatible with the iPhone, accessibility and mobility will never be an issue again! Spruce up your site with one of these amazing themes from WordPress by ThemeFuse. And better than that, do it for free! Here’s what you need to do to get the chance to win. Leave us a comment telling us why you want a new WordPress theme. Then, log into your Twitter account and tweet about the giveaway. Finally, just head on over to our ThemeFuse Facebook page and give us a quick like! To make it easier for you, we’ve set up the giveaway via Rafflecopter, so just follow the prompts below. Next week, you will see the names of the winners posted, so stay tuned!